<h4>GAMIFICATION</h4> <p>You can now make the learning journey more engaging by adding Badges and Achievements, and encouraging competition on the company-wide Leaderboard. </p> <h4>Continuous Learning</h4> <p>As a mobile solution, the Knowledge Arcade’s notifications are perfect for engaging with today’s learner. Now you can deliver a continuous learning experience to an ‘always on’ audience and reach them where it matters. </p> <h4>Mobile First eLearning</h4> <p>To change behaviour, your content needs to be as accessible as possible. The Knowledge Arcade’s Quests, Battles and Challenges are mobile-ready, and perform flawlessly on mobile devices, tablets, laptops and desktops. </p> <h4>Clubs</h4> <p>You can create Clubs for different departments, branches or sub-brands within your organisation. Learners will be able to visit any Club they happen to be a member of and start discussions that really matter to them. </p> <h4>PERSONALISATION</h4> <p>Personalisation creates more meaningful learning experiences. Learners can upload a profile photo and bio, and build their own training library. You can create and edit all your Quests, Battles and Challenges here. From here, you can also access the Genie content authoring tool and easily create and launch bite size learning games in no time at all. You can create and edit your Quests, Battles and Challenges here. From here, you can also access the Genie content authoring tool and easily create and launch bite size learning games in no time at all. A mobile learning solution needs custom made, mobile-first content. At Growth Engineering, we’ve developed some new content types specifically designed to engage learners on their mobile devices. Quests are bite size assets that your learners can complete in a matter of minutes. These micro-units can be created using the integrated Genie authoring tool and come with a range of gamification options. You can build these peer-to-peer, quiz-based Battles from a select group of questions. The competition drives learner activity, as they fight to seal their place on the Battles leaderboard and demonstrate their mastery. Challenges let you set appropriate tasks, encouraging users to put what they’ve learned into practice. Their peers can them Like and comment, giving learners feedback and highlighting the most valuable responses. You can categorise all content into folders and subfolders, so it’s easy for your learners to find training material. If they need a specific piece of content, they can use the Library search bar to locate it. In the Knowledge Arcade’s Admin Panel, you can arrange all your learners into flexible user groups. These determine which content is visible to any learner, depending on their team, location, position or role. Any content your learners upload (as part of a Challenge, for example) can be used to build and expand the Library of formal learning content. Admins can gauge the popularity of each unit using the social reports. The Knowledge Arcade makes it easy to manage all the users on the platform. You can add users individually or in bulk, arrange everybody in groups to ensure they all see relevant content and assign user permissions. The Knowledge Arcade makes it easy to manage all the users on the platform. You can add users individually or in bulk, arrange everybody in groups to ensure they all see relevant content and assign permissions. Learners can find and complete content and interact with other learners in their team. Experts take ownership of a subject and respond to related questions the learners ask. Our hierarchy system lets you arrange all users in a way that works for you (e.g. based on their region, branch or department). It can even be used to deliver different content to different brands in your organisation. Managers can edit Learners in their teams and generate reports to gauge their progress. Admins have complete access and visibility over all users, content, and admin features. You can add, delete or edit any user individually or in batches by importing a spreadsheet. You can also populate your teams by synchronising the platform with other HR systems (See: Integrations). Gamification lets you use gaming mechanics in non-gaming scenarios. 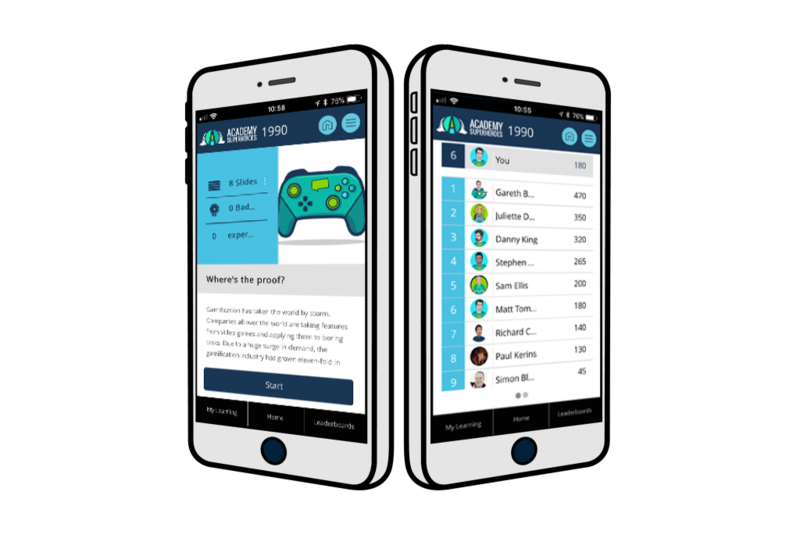 The Knowledge Arcade is fully gamified to let you create an effective engagement strategy complete with Badges, Experience Points and Leaderboards. Learners earn these collectible virtual rewards by completing or downloading content. You can change their names, descriptions and look to suit your needs and ensure that they resonate with your learners’ experiences. Whenever a Learner earns a badge, an update appears in the social news feed. This lets them show off their achievement to everyone in their team and it encourages other Learners to complete additional content. Experience Points (XP) act as a virtual currency that learners can earn on the Knowledge Arcade. You can assign them to all content and certain actions on the platform to give users something else to work towards. The Knowledge Arcade includes access to our mobile authoring tool, Genie. This gives you everything you need to produce engaging Quests, Battles & Challenges that can be categorised and pushed to your Library. This area gives learners an at-a-glance view of all the rewards they’ve earned and acts as a high-level summary of all the content they’ve consumed and shows what they still need to complete to earn more Badges. Learners earn Achievements by interacting with the Knowledge Arcade. As an Admin, you can customise the name, description and look, and also specify what the learner needs to do to trigger the Achievement. As Learners earn more Badges, they climb further up the league table. The leaderboards are divided according to your user hierarchy, giving you complete control over who your learners are competing against. With no technical expertise required, you can package your learning Quests in one of our engaging game templates. These add an extra dimension of interactivity and make the learning experience more interesting. Today’s learners are accustomed to using their mobile devices to communicate with each other. Now, you can open the conversation and get your people talking with The Knowledge Arcade’s social features. When a Learner completes some training content, they can rate their experience and share their thoughts in the comments. By reviewing the comments you can place the most popular content more prominently. Clubs are discussion groups based on the topics that matter to you and your organisation. These groups have their own Top Contributors Leaderboards, showing you which posts have been voted the most useful. You can create Clubs around the main topics in your organisation. Users who interact regularly with these Clubs have the chance to demonstrate their knowledge, making it easier to identify subject matter experts. The main news feed on the Knowledge Arcade shows an update of all user actions on the platform. Here, users can share links and comments, and rate their peers’ content, giving more visibility to popular content. The Knowledge Arcade’s Challenges feature encourages learners to upload their own images and videos as part of their training. This content can then be used to create more relevant assets for future training. Experts have their own area of the platform, where other learners can find them and communicate with them directly. This highlights individuals who can answer questions relating to their area of expertise. Experts can add questions to the Frequently Asked Questions (FAQs) section of the Knowledge Arcade. This helps build a bank of useful information and gives your learners instant access to the answers they need. Personalisation creates more meaningful learning experiences. Learners can upload a profile photo and bio, and build their own training library. At any stage, learners can customise their preferences in the User Settings area. For instance, learners can alter their language settings, date and time settings or edit the details in their public profile. Each user’s Profile featuring their profile picture, their bio and any other details they’ve included. It also includes their position on the Leaderboard, showing other learners what they need to do to beat them. All learners have their own Showcase area where they can share things like infographics, tips or quotes. All Showcase images can be ‘Liked’ and commented on, expanding the social feature set of the Knowledge Arcade. The Knowledge Arcade’s settings let you customise your platform and create the perfect mobile app for your organisation. This lets you change on-screen text, set the language and configure the look & feel options. The Knowledge Arcade can be customised in several ways, letting you add a logo, set your brand colours and specify your fonts. These options are configured in the setup process, so that your app feels just right. When learners open their app for the first time, they’ll see the Homepage, where they’ll need to log in to the app. We’ll work with you to build a login screen that fits your brand, looks good and serves its purpose. During the setup process, you can pick your own custom domain name for your platform. This is another way to give your Knowledge Arcade its own identity and give your learners a system that was built with them in mind. Give your app an icon that can hold pride of place on users’ home screens. First impressions count, so we’ll work with you to design an app icon that fits your brand, your learning objectives and your needs! As an Admin, you can customise your Clubs by uploading your own banners. This lets you use high-impact imagery to draw attention to new training initiatives, or communicate with every learner using the Knowledge Arcade. The Knowledge Arcade can be configured to deliver training to a multi-lingual learner base, using the learner groups function. You can also edit any on-screen text in the settings section of the Admin area. The Knowledge Arcade lets Admins run reports by learner or by content. You can also export your own custom reports to a spreadsheet, or schedule your reports to be delivered to specific people at set intervals. All Knowledge Arcade content is created using the Genie authoring tool, and meets xAPI technical standards. This ensures that you have all the learner data you need when it comes to evaluation. You can use the Knowledge Arcade’s Reports wizard to generate custom reports. A variety of filters helps you narrow down the information (by team, topic, etc. ), and export the data in the most convenient way for you. Quests, Battles and Challenges let you gather data about your learners’ behaviour. You can report on Quest completion, Battles progress, and Challenge submissions, giving you a good picture of your learners’ activity. 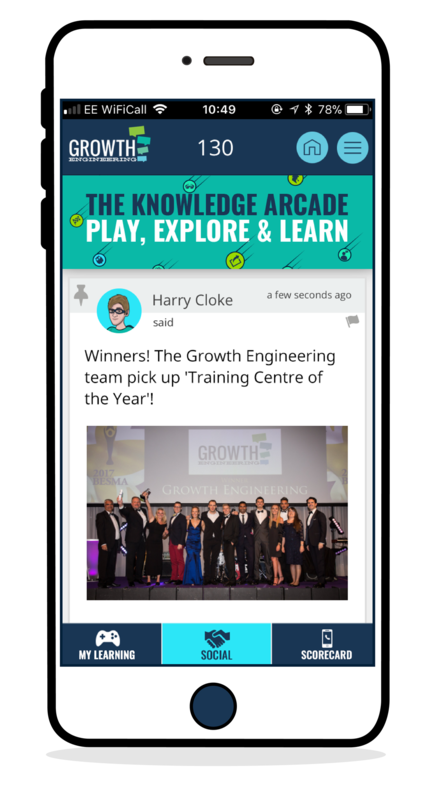 The Knowledge Arcade’s reporting dashboard gives you an overhead view of what your learners get up to throughout the mobile app, including login rates, content completion and social interactions in Clubs. Once you have created a custom report, you can schedule it to run automatically at a time that suits you. You can also specify a list of emails in the settings, ensuring that the key people get the data they need. The Knowledge Arcade is built to give you the reports that matter the most to you. You can use the custom field functionality to upload your own custom data and include it as a separate field in one of your Reports. Get an extra level of insight by adding a Google Analytics tracking code to the Knowledge Arcade. This small addition unlocks the reporting capabilities of Google Analytics, as well as those of the Knowledge Arcade. Although an online solution is easier in most cases, some topics are best taught in a classroom setting. The blended learning tools on the Academy LMS help you bridge the gap between online and offline learning. Create and manage events, designate coordinators, allocate resources and send reminders. These features also let learners and trainers use the mobile app in instructor-led classroom training sessions. The Knowledge Arcade API lets you connect your mobile app to an existing application. For example, integrating with your HRIS or ERP system lets you automate tasks like adding, amending or deleting users. If our current integrations don’t fit your needs, we are happy to develop custom integrations. Get in touch with us to discuss what your organisation needs and how our Knowledge Arcade integrations can help. When a push notification won’t cut it, you can use our library of email templates in the Admin panel to send longer messages to your learners. You can also add images, choose your font and edit the font colour. For larger networks of learners, we can configure The Academy LMS to support a Multi-Tenant learning solution. This includes multiple login areas, custom domain names and branding, and user segmentation. You can get more from your instructor-led training by using the Knowledge Arcade app in classroom sessions. You can use it to help manage the event and to run live assessments with real time performance reports. The Knowledge Arcade can securely share data with other applications you use to manage your learners. Current integrations include authentication, single sign-on (SSO) and user data drop, to name a few. We make every effort to ensure that our training solutions comply with current data security best practice. All sensitive data within the platform is encrypted in transit with SSL at customer request. If you run into technical problems, or you just need help getting the most out of the Knowledge Arcade, you can contact the Growth Engineering support team by submitting a ticket in your Admin Panel. If your learners don’t have an internet connection, the Knowledge Arcade lets them download their learning content, complete it offline and synchronise the results the next time they have an active connection. With the Knowledge Arcade, you can ensure the environment is personalised for your learners. They can set the language, pick the content they’re interested in, join Clubs, upload a photo and compose their bio.